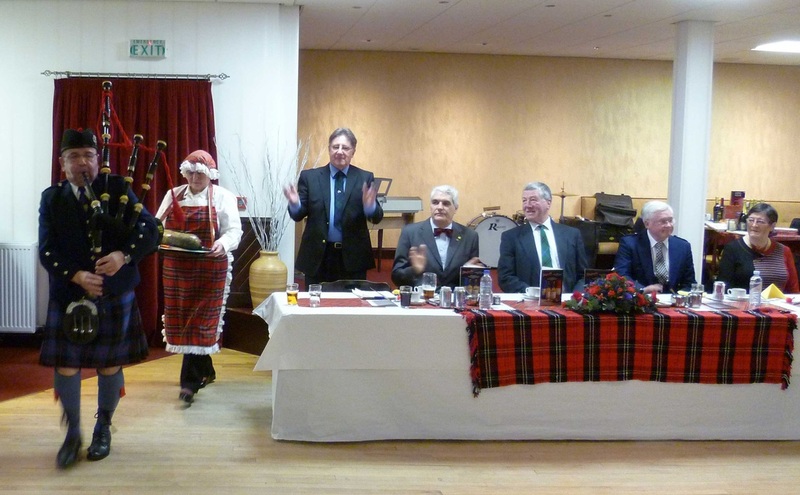 This years Burns Supper was held in Carnoustie at the British Legion lounge. A party travelled from Maule to attend arriving in Carnoustie on Thursday evening. On Friday morning they made the trip to Dundee where they were given an insight into the history of the city of Discovery and spent the remainder of the day with hosts. Saturday was again spent with hosts before the Burns Supper held in the evening. The evening commenced with a welcome to the assembled party by Roger Jeffrey, Chairman of Carnoustie Twinning Association and this was reciprocated by Michel Contet, Chairman of the Maule/Aulnay Association. 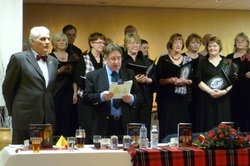 The picture on the left shows both Chairmen - Roger on right and Michel on the left - backed by the Carnoustie Choir who performed a number of Scots songs to start the evening off. 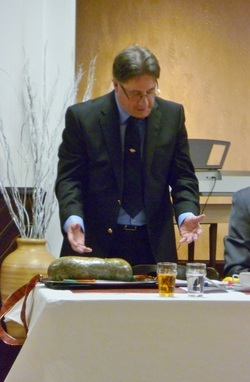 Following the address the Selkirk Grace was given by Max Fordyce a traditional Burns meal of Scots Broth followed by Haggis, Neeps and Tatties was served and greatly enjoyed by all. This was delivered by John Henderson who gave an insight into the works of Burns. He included quotes from Burns more famous works and also examined the links between the English, Scots and French languages which Burns used to great effect in many of his poems and songs. He gave an insight into Burns early life including the fact that his father insisted that all his children received a good education and employed John Murdoch who among other things tutored Burns in the French a language he later mastered to a high degree. Burns composed his first poem 'Handsome Nell' when he was 14 years old. This was inspired by a young girl who had helped with the harvest. Many of his later works were also inspired by the ladies who appear to have been one of his main sources of inspiration - and weakness. An idea of how Burns fitted into 18th century Edinburgh society was also covered and the fact he was well educated assisted him here very well. John also demonstrated how Burns sense of humour cames across in many of his works and how he was not afraid to poke fun at the establishment, even when he was employed as an Excise Man. Brave or just confident in his own ability? Every one has their own opinion on that. The toast to the lasses was given by Rodger Brunton who took a humorous approach and dared to suggest that men were superior a view which as can be seen from the picture apparently failed to impress Francoise Svensson who was to deliver the reply. Francoise did in fact demonstrate this in her reply and she gave a number of examples to prove that men are in fact superior - so long as women allow them to be! Both gave an ecellent account of themselves and in the end we think it was a draw. The formal part of the evening concluded with a rendition of 'Tam O'Shanter' given by Peter Murphy and the evening was rounded off with Scots dancing to music provided by the Traditionals. Another great evening which was thoroughly enjoyed by all. On Sunday there was a joint committee meeting held to discus upcoming events including the proposed joint visit, details of which will be posted soon. The French party return on Monday at the end of another successful Burns Supper.